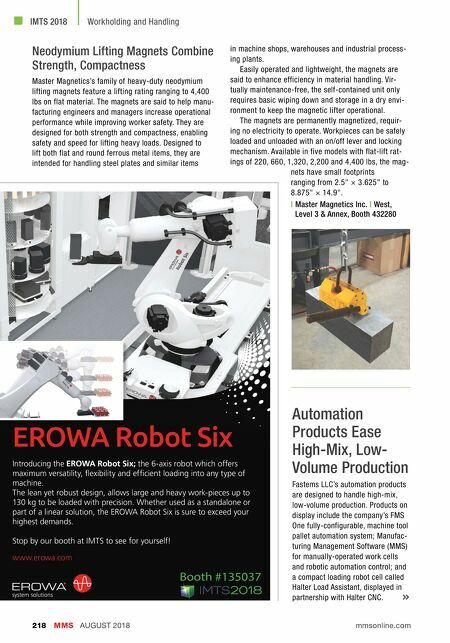 MMS AUGUST 2018 218 mmsonline.com IMTS 2018 Workholding and Handling Booth #135037 www.erowa.com Introducing the EROWA Robot Six; the 6-axis robot which offers maximum versatility, exibility and ef cient loading into any type of machine. The lean yet robust design, allows large and heavy work-pieces up to 130 kg to be loaded with precision. Whether used as a standalone or part of a linear solution, the EROWA Robot Six is sure to exceed your highest demands. 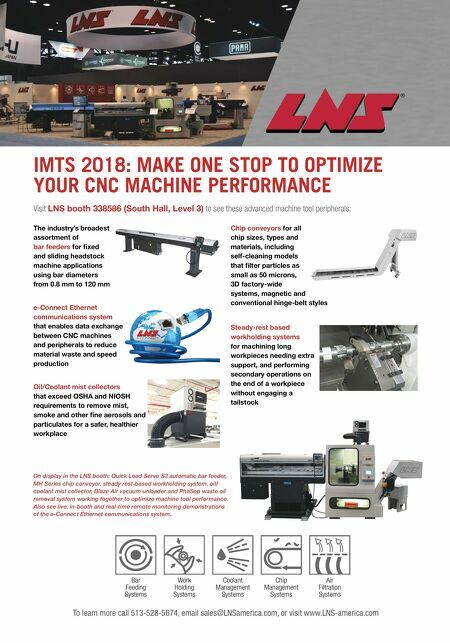 Stop by our booth at IMTS to see for yourself! EROWA Robot Six Neodymium Lifting Magnets Combine Strength, Compactness Master Magnetics's family of heavy-duty neodymium lifting magnets feature a lifting rating ranging to 4,400 lbs on flat material. The magnets are said to help manu- facturing engineers and managers increase operational performance while improving worker safety. They are designed for both strength and compactness, enabling safety and speed for lifting heavy loads. Designed to lift both flat and round ferrous metal items, they are intended for handling steel plates and similar items in machine shops, warehouses and industrial process- ing plants. Easily operated and lightweight, the magnets are said to enhance efficiency in material handling. Vir- tually maintenance-free, the self-contained unit only requires basic wiping down and storage in a dry envi- ronment to keep the magnetic lifter operational. The magnets are permanently magnetized, requir- ing no electricity to operate. Workpieces can be safely loaded and unloaded with an on/off lever and locking mechanism. Available in five models with flat-lift rat- ings of 220, 660, 1,320, 2,200 and 4,400 lbs, the mag- nets have small footprints ranging from 2.5" × 3.625" to 8.875" × 14.9". | Master Magnetics Inc. | West, Level 3 & Annex, Booth 432280 Automation Products Ease High-Mix, Low- Volume Production Fastems LLC's automation products are designed to handle high-mix, low-volume production. Products on display include the company's FMS One fully-configurable, machine tool pallet automation system; Manufac- turing Management Software (MMS) for manually-operated work cells and robotic automation control; and a compact loading robot cell called Halter Load Assistant, displayed in partnership with Halter CNC.